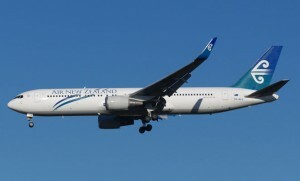 A file image of an Air New Zealand 767. Air New Zealand has ruled out a bird strike as the cause of the engine problem which forced a Perth-bound Boeing 767 operating to NZ175 to return to Auckland on June 9. “The pilots reduced takeoff thrust as normal when they were airborne, but at this time there was an interruption to the airflow through the left hand engine which caused the flare seen from the rear of the engine,” Air New Zealand said in a statement. “The pilots followed procedure by further reducing thrust on the affected left hand engine and it began operating normally. Regardless of the engine returning to normal operating levels, the pilots followed Air New Zealand’s conservative operating procedures and undertook a precautionary engine shut down before returning to the airport so the cause of the airflow disruption could be determined,” explained the airline. Engineers began an immediate inspection of the problem engine following the incident, with no signs of visible damage reported. Air New Zealand chief pilot and general manager Airline Operations and Safety, Captain David Morgan has since said that the investigation “established no evidence of bird strike” as a possible cause for the engine’s airflow disruption and no damage to the engine itself. “The unit responsible for the control of airflow through the engine has been removed and will be sent to the manufacturer for testing. We have replaced the unit and will now undertake engine tests in conjunction with the engine manufacturer GE,” Morgan added.